Single owner since built in 1994. Building and property has gone through major renovation to include interior and exterior upgrades, new HVAC, furniture, beverage fountains, signage, and kitchen/prep area equipment. Same manager at this location for over nineteen years. Great visibility from major highway with ingress/egress of Bells Highway. Within one mile of other fast food locations and close to I-95 exit. 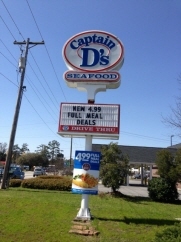 Currently a Captain D's franchise.